For over 15 years, Enerconcept Technologies has brought fresh air into buildings. Now, Enerconcept brings light! 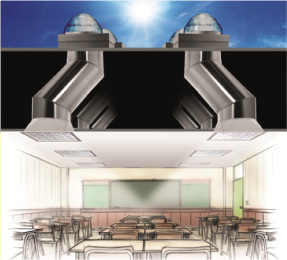 In addition to offering the world’s most efficient solar air heating systems and textile ductwork providing an improved air quality, Enerconcept now offers another simple,clean, cost-effective solar solution: Solatube’s daylighting systems. Solatube has been the world leader in daylighting systems for over 20 years. Solatube’s daylight devices can be installed on any type of roof. They collect natural light and direct it indoors through a highly reflective tube. There are an ecological, economic and aesthetic way to use natural light to illuminate spaces of any dimension.